He had basic at Gunter Field, AL and graduated from Napier Field, AL. Awards: Air Medal, 1 Oak Leaf Cluster, 3 battle stars. He had Basic at Gunter Field, AL, and graduated at Marianna Air Field, FL, S/N: O-810291. Was assigned to Warner Robins A. F. B. Buried Sect L, Grave 731, in Southern Nevada Veterans’ Cemetery, Boulder City, NV. Roommate of Norman Austin. Bruce Campbell and Paul Plaginos were his instructors at Douglas. He graduated from George Field, IL. Then instructed in Basic at Newport AAFd. Later flew C-47’s in India. Student Officer: Second Lieutenant, Squadron E. A William W. Bell (S/N: O-743750) became a bombardier in the 454th Bomb Grp, 737th Bomb Sqdn flying in B-24s. Their plane was hit by flak and crashed in Barcelona Spain in April 1944, and he and the rest of the crew were interned in Spain. He and the crew were returned to Allied control on June 6, 1944 (MACR 4629). Died Aug. 31, 1997, age 74. Lived in Blair County, PA. He moved to Central Florida in 1986. Bruce Campbell was his instructor at Douglas. He washed out at Douglas. Served as a SGT in the Army Air Force. He attended the Univ. of W. Virginia prior to the Service. Bruce Campbell was his instructor at Douglas. He had Basic at Gunter Field, AL and Advanced at George Field, IL. S/N: O-811317. He went with the 456th Bomb Group at Boise ID. Then it was the 15th Air Force in Italy in B-24’s. Bruce Campbell was his instructor at Douglas. He washed out at Douglas. Bruce Campbell was his instructor at Douglas. He washed out at Douglas but remained in the Air Force during World War II and Korea. Student Officer: Second Lieutenant, Squadron H. He likely became the B-25 pilot in the 345th Bomb Group’s 498th and 499th Squadrons in the Negros Islands, Philippines. In 1945, his plane suffered an explosion and a large hole caused by a hung up parafrag (a small, fragmenting bomb attached to a parachute. Read about it here. Boyd brought the plane down safely despite the damage. Enlisted May 08, 1941. Bruce Campbell was his instructor at Douglas. He washed out at Douglas. Basic at Gunter Fld, AL, graduated from George Field, IL. S/N: O-811333. Was assigned to 2nd A. F. at Boise, ID. Later was in the 456th Bomb Group flying B-24’s in Italy. He became a bombardier/navigator. Earned an Air Medal while in the 340th Bomb Group, 487th Bomb Sqdn (See http://57thbombwing.com/340th_History/487th_History/transcripts/16_Hist_Aug_1944_transcript.pdf). For a picture, click here. Served in the South Pacific stationed at Hickam Field in Hawaii. Student Officer: Second Lieutenant, Squadron G at Douglas. Harold had Basic at Gunter Field, AL. and graduated from Marianna, Field, FL. S/N: O-810344. and was assigned to Tallahassee. He was in the 405th Fighter Group 511th Fighter Sqdn. Harold was killed Dec. 18, 1943 when a propeller came off of a P-39 that he was flying, at Congaree, S.C. He may have been the Thomas E. Geary who flew in the European Theater. Per the obituary of Thomas E. Geary he received the Air Medal with 4 Oak Leaf Clusters. He was promoted to Technical Sergeant at 21 years of age for “meritorious achievement” while participating in numerous bombing attacks against military and industrial targets in Western Europe (per obituary in Salem News). Possibly born on November 7, 1922 in Danvers, MA. Possibly died October 24, 2013 (per obituary in Salem News). Bud Gillespie was his Instructor at Douglas. He went to Gunter Field, AL for Basic and to George Field, IL. for Advanced and graduated Aug. 30, 1943, S/N: O-813663. His 1st assignment was the 2nd Air Force at Boise, ID. He flew B-24’s. He was shot down Feb. 25, 1944 over Yugoslavia on a mission to Regensburg, Germany. He spent 15 months in a P.O.W. Camp at Stalag Luft, Barth, Germany. He was liberated by the Russians May 3, 1945. He became a lawyer and was with the F.B.I. He attended N.C. State U. prior to military service. He had Basic at Gunter, AL & graduated from George, IL. S/N: O-811366. Wilson was in the 15th A.F., 456th Bomb Group, 746th Bomb Sqdn. He was copilot of a B-24 G (S/N: 42-78256) with Capt. Frederick W. Hyde, Jr. as pilot, leaving Stornara Field in Italy. His plane was shot down and he was killed while over Blechhammer, Germany on Aug. 22, 1944. His ship received a direct flak hit on the left wing after “bombs away”. Flame erupted around the tail and the plane fell off to the left. Only two men survived. (MACR #8006) It is believed he was killed on his 50th mission. His body was recovered at Steinbirn on Aug 22, 1944 and was buried at local cemetery Mechnitz, District Neustadt. Had basic at Gunter Field, AL, graduated at Blytheville, IL. S/N: O-810139. He was with the 382nd Bomb Group 872nd Bomb Sqdn (Very Heavy Bombs). See Roster of Officers 382nd Bomb Group. He enlisted 03 Apr 1941. He washed out. Bill Sager was his Instructor. He washed out while at Douglas and was sent to the Weather Service. He served in England. He retired from the Air Force Reserve (Intelligence) as a full Colonel. Then he was a Geography Professor at the Northern Illinois University at DeKalb. He retired from this in 1986. Click here for his bio and pictures (a PDF). Of DeKalb, IL. and Lincoln, NE. From his obituary: He worked on the family farm until joining the United States Army Air Corps in 1941. He was stationed on the west coast at the time of the Pearl Harbor bombing and continued to serve his country until his honorable discharge in 1945. Frank Presley and Roy McDonald were his instructors. He went on to Gunter Air Force Base, Montgomery, AL. for Basic but washed out. He became a navigator (S/N: O-709366). On July 21, 1944, he was navigator on a B-24J (S/N: 42-110034) on a mission to Germany. Near Munich, the plane was attacked by enemy fighters. The crew bailed out and he became a P.O.W. at Luft-Stalag #1 located near Barth, Germany (MACR #7805). Major Heath was living in Colonial Heights, VA in 2010. He had basic at Gunter Air Force Base, Montgomery, AL. Graduated from George Army Air Corps Field, Lawrence County, IL. S/N: O-811379. Assigned to 3rd Air Force at Greenville, SC. Final rank: Major. Lloyd had Basic at Gunter Field, AL. and graduated from George Field, IL. S/N: O-811381. Later he was with the 492nd Liberator Grp, 858th Bomb Sqdn. He married Anna at Scott Field, IL. in Aug. 1943. On May 19, 1944 he was the pilot of a B-24J (S/N: 44-110153) that was shot down while on a bombing mission to Brunswick, Germany. The aircraft was attacked by approximately 50 enemy aircraft: Me 109’s and FW 190’s, in the Hannover area. The plane dropped out of formation and 8 chutes were seen to open. The aircraft was seen to go down through the undercast still under control. However, the entire crew was lost (MACR #5240). Anna remarried and became Mrs. Anna M. Croghan. Bill Sager and then Rumpler were his instructors at Douglas. He graduated from George Field, IL. He went on to twin engine training at Lawrenceville, IL. and Bergstrom AFB in Austin, Texas for C-47 training. He was then with the 316th Troop Carrier Group in England. Click here for his bio and picture (PDF). 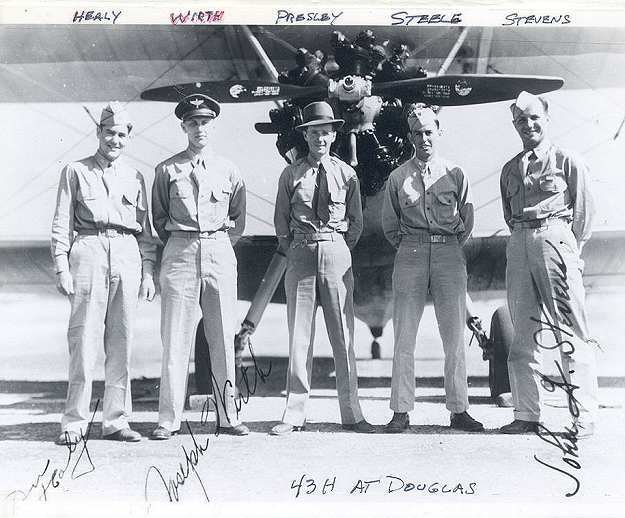 After graduating from Marianna Air Field, FL, he instructed at Gunter Field. He taught B-24’s with B-29 turrets for gunnery students at Harlingen Army Gunnery School. He stayed in the Reserve and was recalled during the Korean War to teach flying training for B-25 radar navigators; then he went on to Okinawa in Air-Sea Rescue. He retired as a Colonel. As a civilian he was an Engineer for the Boeing Aircraft Co. for 40 years until retiring in 1992. Student Officer: Second Lieutenant, Squadron F.
Enlisted in Chicago on 14 Jun 1941. Born Aug. 28, 1918 in Illinois. He became a navigator/bombardier (S/N: O-698120). He was in the 498th Bomb Group 875th Bomb Sqdn (Very Heavy Bombs). On Jan. 3, 1945, he was navigator on a B-29 (S/N: 42-24748) on a bombing mission to Nagoya, Japan. Upon the return from the bombing run, the plane disappeared and all 11 members of the crew were determined to be killed in action (MACR #10853). He had basic at Gunter Air Force Base, Montgomery, AL. Graduated from George Army Air Corps Field, Lawrence County, IL. S/N: O-811387. He transferred to the 306th Bomb Group 367th Bomb Sqdn from the 2AF 18th Replacment Training Wing at Salt Lake City. On May 8, 1944, he was killed in a mid-air collision between 3 B-17’s near Perleberg, Germany when one of the bombers in the formation got caught up in prop wash and came down on top of Jacobs’ plane, knocking his plane’s tail off completely. The tail fell and damaged the B-17 below him (MACR #4554). All three planes crashed and nearly all crew members from the planes were killed. He had basic at Gunter Air Force Base, Montgomery, AL. Graduated from George Army Air Corps Field, Lawrence County, IL. Had basic at Gunter Air Force Base, Montgomery, AL. Graduated Blytheville Army Airfield, Arkansas. Had basic at Gunter Air Force Base, Montgomery, AL. Graduated at Blytheville Army Airfield, Arkansas. Served in both World War II and the Korean War. Buried at Santa Fe National Cemetery in Santa Fe, NM. Had basic at Gunter Air Force Base, Montgomery, AL. Graduated from George Army Air Corps Field, Lawrence County, IL. He was at Tuskegee AAFd Advanced Flying School, per Aviation Archeaological Investigation & Research web site. Born November 22, 1922 in Akron, OH. Died June 17, 2003, York, PA.
Had basic at Gunter Air Force Base, Montgomery, AL. Graduated at Blytheville Army Airfield, Arkansas. He became a navigator (S/N: O-700808) in B-17’s with the 351st Bomb Group 508th Bomb Sqdn and served in missions over France and Germany. See http://351st.org/ for a list of his missions. He became a bombardier/navigator (S/N: O-698128) with the 499th Bomb Group 877th Bomb Sqdn (Very Heavy Bombs). On June 1, 1945 he was bombardier in a B-29 (S/N: 44-0083) on a mission to Osaka Japan. The plane was leading the first airborne squadron. Fifteen to twenty seconds before “bombs away” the plane was hit by a heavy burst of flak just forward of the bomb bay. The aircraft pulled up and to the right to avoid collision with the aircraft on its right wing, and then it fell off and crashed. Kniznick was killed. His grave marker is in the Manila American Cemetery, Manila City, Philippines (see Find-A-Grave). Had basic at Gunter Air Force Base, Montgomery, AL. Graduated at Blytheville Army Airfield, Arkansas, S/N: O-810171. He was with the 15 A.F., 485th Bomb Group 831st Bomb Sqdn. On July 20, 1944 he was co-pilot on a B-24J 1944 (S/N: 44-40886) with a crew of 10 on a mission to Friederickshafen, Germany. The plane was shot down by five FW-190s in the vicinity of Vittorio Veneto, Italy. The number 2 engine was hit and something exploded in the nose. LaMar bailed out at 23,000 feet. He was reunited with some of the rest of the crew on the ground, and the Italians assisted them in returning to Allied lines (MACR #6914). Possibly this John Longo: “He served in the New York National Guard 69th Regiment in the 1930s and was sent to Europe during World War II. He was a decorated veteran assigned to the 9th Air Force and was awarded numerous medals, including the Presidential Unit Citation, for service in France, Belgium and England.” Source: http://www.poconorecord.com. Had basic at Gunter Air Force Base, Montgomery, AL. Graduated from George Army Air Corps Field, Lawrence County, IL. S/N: O-811411. He was assigned to the 2nd A.F. at Boise. Later he flew B-24s in England with the 458th Bomb Group 753rd Bomb Sqdn and flew 31 missions. After that he hauled gas and other supplies to the front lines in B-24 bomb bay racks. Read his bio here (PDF). Had basic at Gunter Air Force Base, Montgomery, AL. Graduated at Blytheville Army Airfield, Arkansas. He flew 33 missions in B-17’s from England with the 96th Bomb Group. He then returned to the U.S. as an instructor pilot of B-17’s and B-29’s. Click here for his bio (PDF). He had Basic at Gunter Field, AL. and graduated from George Field, Lawrence County, IL. S/N: O-811413. He was assigned to the 2nd AF. at Salt Lake City. He flew B-17’s with the 8th A.F. 384th Bomb Group 547th Bomb Sqdn in England. He was released at the end of the war. He stayed in the Reserve to attain the rank of Lt. Col. At that time he was instructing in B-29’ s.
He became a bombardier (S/N: O-692501). He was with the 483rd Bomb Group 816th Bomb Sqdn. On Jul. 18, 1944 he was a bombardier on a B-17G (S/N: 42-107172) on a mission to Menninghem Aerodrome, Germany. The plane was shot down and and he was reported MIA. It was about his 33rd mission. He graduated from Blytheville Army Airfield, Arkansas. He became a B-24 Pilot with the 15th A.F. in Italy. He flew 52 missions. He had Basic at Gunter Field, AL. and graduated from Marianna in FL. S/N: O-810396. He flew P-47’s in the 404th Fighter Group 506th Fighter Sqdn from England over Belgium and France. He supposedly bellied in on a street in Belgium, fully armed, and walked away from it. After the War he was with the Blue Cross, Blue Shield in Southern New Jersey. He had Basic at Gunter Field, AL. and graduated from George Field, Lawrence County, IL. S/N: O-811419. He was in the 100th Bomb Group 349th Bomb Sqdn. On June 12, 1944, he was pilot of a B-17G (S/N: 42-97883) with a crew of 10 on a mission to Rosières-en-Santerre in France. The plane was hit by flak over Dunkirk. No. 3 engine caught fire and the fire spread to engine 4. Engines 1 and 2 were also damaged. He left the formation in a dive in an attempt to put out the fire, but each time he levelled out the fire would start again. While flying parallel to the English coast, he ordered his crew to bail out. He was the last to leave the ship, at 800 feet. He was picked up by a life boat, probably from the Royal Navy, but several others in his crew drowned, failed to open their chutes, or were M.I.A. (MACR #6521). McKeague died a few days later. S/N: O-887210. He was in the 9th AF 422nd Night Fighter Squadron. Rundlett was his instructor. Graduated from Marianna Army Air Field in FL, S/N: O-810399. Was assigned to Tallahassee, FL AFB. He was in the 405th Fighter Group 509th Fighter Sqdn. On July 31, 1944 he was flying a P-47D (S/N: 42-75454) when it developed engine trouble. He called on the radio that he was bailing out, but he was killed (MACR #7924). He received the Army Air Medal, four Oak Leaf Clusters. Had basic at Gunter Air Force Base, Montgomery, AL. Graduated at Blytheville Army Airfield, Arkansas. Pyote AAFd, Texas in the 19th Combat Crew Training Station (B-17s). He was killed in a flying accident Mar. 21, 1944. He died when the B-24 he was in struck a mountain peak in the Atlas Mountains of North Africa on its way overseas. See FindAGrave. He was the 449th Bomb Group, 719th Bomb Squadron Staff Intelligence Officer. He became a navigator, per Selman Field During WWII, Turner Pub’l Co.
See FindAGrave. He was a pilot in the Army Air Corps and a navigation instructor in Georgia. Twin engine pilot, graduating from George Field, in class of 43K. See Wingspan: Class 43K – George Field, ILL.
Rundlett was his instructor at Douglas. Had basic at Gunter Air Force Base, Montgomery, AL. Graduated from George Army Air Corps Field, Lawrence County, IL. S/N: O-811431. He was in the 95th Bomb Group 334th Bomb Sqdn flying B-17s. Rufus Rundlett was his instructor. He had Basic at Gunter Air Force Base, Montgomery, AL. and graduated from Marianna Army Air Field in FL, S/N: O-810406. He was assigned to the Tallahassee A.F.B., FL. and later was flying with the 8th Air Force 406th Fighter Group 512th Bomb Sqdn in England. He was killed by enemy anti-aircraft while over France on Aug. 4, 1944. He is buried in France. Click here for more info. Ted Roman was his Instructor. He was washed out because he could not land the plane and tended to “ground loop.” He was sent to radio school in Sioux Falls, SD and then to Kingman, AZ for gunnery school. He went to MacDill Field in Tampa to become a member of a crew of a B-17. Because he was 5’7″ he was reassigned to the ball turret. 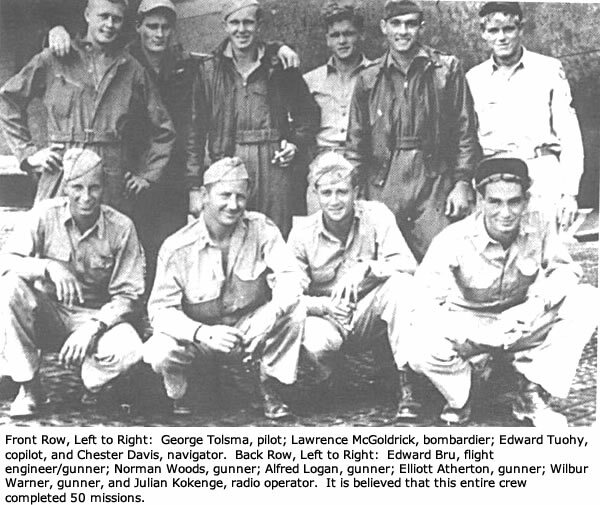 His crew went to Europe on the Queen Elizabeth, where they were in the 95th Bomb Group. On his second mission, his plane was hit by flak and lost 2 engines. They did a forced landing in Belgium. He flew 9 missions. Bud was president of the 8th Air Force Historical Society of S. Carolina. Raised in Elizabeth, N.J. Later of Hilton Head Island, S.C.
Had basic at Gunter Air Force Base, Montgomery, AL. Graduated at Blytheville Army Airfield, Arkansas, S/N: O-810221. He was with the Dodge City AAFd Bomber Pilot Training School (B-26C). He was killed in a flying accident on Apr. 17, 1944 (in MN), per Steve Burris. He washed out at Douglas (but Orders show he graduated from Blytheville). He served in the U.S.A. He was a Crew Chief at Galveston and Colorado Springs in the Instruction Indoctrination Unit. DuPraw was his instructor. Had basic at Gunter Air Force Base, Montgomery, AL. Graduated at Blytheville Army Airfield, Arkansas, S/N: O-810222. He was in the 1st Combat Carrier Group, 1st Combat Carrier Sqdn and at Stuttgart, AR AAFd Advanced Flying School. DuPraw was his Instructor. He completed Primary but left flight training in Basic. He served in other capacities during the war. Dupraw was his instructor. Had basic at Gunter Air Force Base, Montgomery, AL. Graduated from George Army Air Corps Field, Lawrence County, IL., S/N: O-811442. Assigned to 2nd Air Force at Boise, ID. Ashley DuPraw was his instructor at Douglas. He was a navigator in B-24’s in the 90th Bomb Group 319th Bomb Sqdn in the Pacific theater. Air medal and three oak leaf clusters. See Find-A-Grave. Died Nov. 19, 2009, age 92. He was a bombardier (S/N: O-757036) in the 388th Bomb Group 560th Bomb Sqdn. He was killed in action Sept. 5, 1944. He is buried in the American Cemetery, Cambridge, England. Citations: Air Medal with Oak Leaf Cluster, Purple Heart. (http://www.abmc.gov). Became a Radio/Gunner in the 310th Bomb Group and 340th Bomb Group, flying in B-25s in Italy (per Fold3). Hoeffler was his Instructor at Douglas. He graduated from Marianna Army Air Field in FL as a Flight Officer T-61226. He was assigned to Tallahassee next. Later he was serving in the South Pacific in 35th Fighter Group 41st Fighter Sqdn flying P-47’s and P-51’s. He had Basic at Gunter Air Force Base, Montgomery, AL. and graduated at Marianna Army Air Field in FL. S/N: O-810421. Then assigned to Tallahassee. He served with the 79th Fighter Group 85th Fighter Squadron in the Italian Campaign. He had 92 Missions— C.T. CD. (completed tour). Awarded the D.F.C. ; Air Medal & 3 OLCs. Of Trenton and Mendham, N.J.
Student Officer: Second Lieutenant, Squadron H at Douglas. 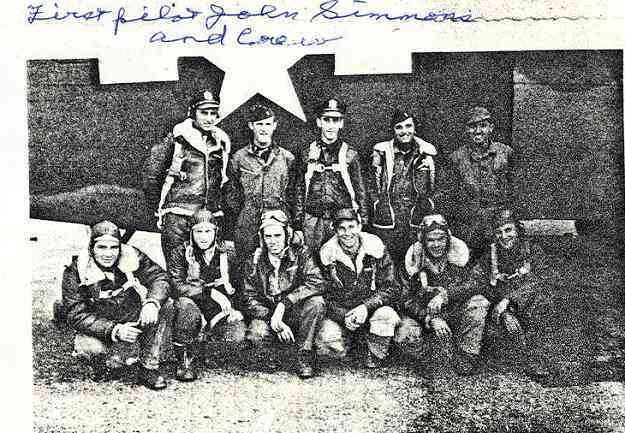 He became a bombardier (S/N: O-757044) with the 306th Bomb Group 367th Bomb Sqdn, per First Over Germany: A History of the 306th Bombardment Group by Russell A. Strong. He graduated from Blytheville Army Airfield, Arkansas. He flew B-17’s and B-24’s with the 8th Air Force, 486th Bomb Group, 835th Bomb Sqdn. He flew 35 combat missions over France, Germany and Belgium. He received the Air Medal with 5 Oak Leaf Clusters and the D.F.C. Click here for a picture of him with his crew. Joe Thalman was his Instructor at Douglas. He had Basic at Gunter Field, AL. and graduated from Advanced at George Field, IL. S/N: O-811457. He went to the 8th A.F., 486th Bomb Group 835th Bomb Sqdn, 3rd Air Division in England. He flew 34 missions. He was released in Mar. 1945. Then he went to Georgia Tech. and became an Engineer. Click here for his military bio with his comments and list of awards (PDF). He had Basic at Gunter Field, AL. and graduated from Blytheville Army Airfield, Arkansas. He went into B-24’s. He served in the 8th A.F. in England, 385th Bomb Group, 550th Bomb Sqdn. He flew 35 missions in B-17’s. He received 4 air medals and 2 D.F.C.s. He said that he had relatively easy combat experience with only a few engines shot out, losing an engine with a resulting fire over the North Sea, and a prop falling off from the heat and fire. He became a dentist after the War. Had basic at Gunter Air Force Base, Montgomery, AL. Graduated at Blytheville Army Airfield, Arkansas. He became a B-24 Pilot. He later transferred to the Troop Carrier Command. Lloyd Annin was his Instructor at Douglas. William graduated from Marianna Field, FL. S/N: O-810428. He was sent to Tallahassee. 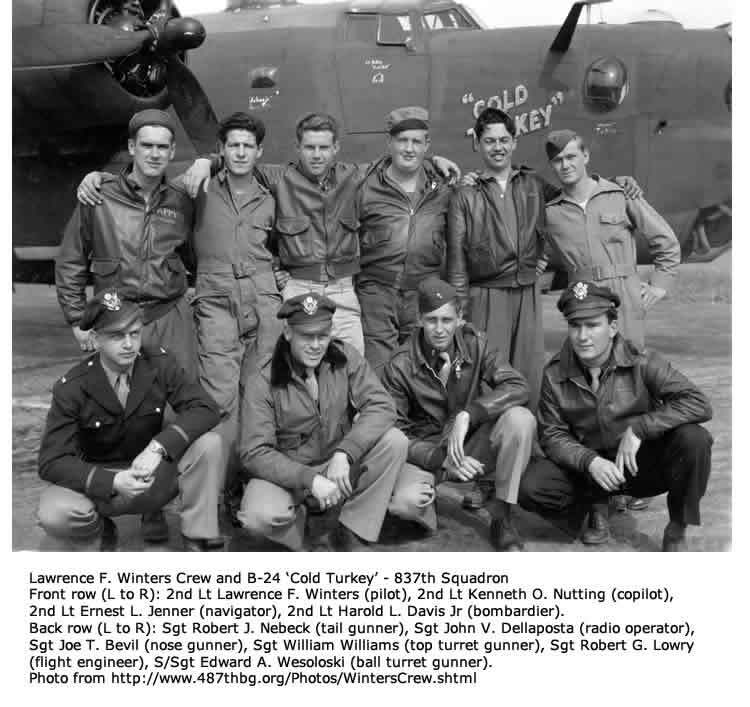 He served in the 12th A.F., 79th Bomb Grp. 86th Bomb Sqdn, in the Mediterranian area. He flew 96 missions in P-47’s. After the war he became an Architect. Had basic at Gunter Field, AL. and graduated from Marianna Field, FL. Flight Officer S/N: T-61227. Was assigned to Tallahassee, FL AFB. He was then in the 406th Fighter Group 512th Fighter Sqdn. On April 9, 1945, he was flying a P-47D (S/N: 44-32948) on a mission to Hanover, Germany when he was hit by flak and his plane crashed. He was killed (MACR #14457). Lloyd Annin was his instructor at Douglas. He had basic at Gunter Field, AL. and Advanced at Blytheville Army Airfield, Arkansas. He taught advanced flying in B-25’s at George Field, IL. He was then sent to Cerignola, Italy with the 15th A.F. 455th Bomb Group 742nd Bomb Sqdn. He was wounded and required skin grafts but he wanted to stay in Europe. So he got a job with the Mediterranean Allied Air Force and flew VIPs, generals, spies, etc. He received a Silver Star, Purple Hearts, air medal and 9 battle stars. He retired as Lt. Colonel. Presley was his instructor at Douglas. Vaughn had Basic at Gunter, AL. and Advanced at Blytheville, Ark. S/N: O-1683579. Then he was checked out on B-24’s. Went overseas to Italy in the 376th Bomb Group 512th Bomb Sqdn and flew 50 missions including 5 over Ploesti. Later he became a Railroad Engineer. Click here for his bio and pictures. He became a bombardier S/N: O-762132. He was with the 351st Bomb Group HQ (The 351st Bomb Group (H) 1942-45 by Peter Harris & Ken Harbour). He was in the D-Day invasion of June 7, 1944. For a list of his missions, see http://351st.org/. Presley and Roy McDonald were his instructors. Had basic at Gunter Air Force Base, Montgomery, AL. Graduated from Marianna Army Air Field in FL as Flight Officer T-61228. He had Basic at Gunter Field, AL. and Advanced at Blytheville Field, Arkansas. John Fraser was the 2nd of his 2 Instructors at Douglas. He was delayed to class 43I. He went into bombers and to Italy. He was in the 15th Air Force, 376th Bomb Group, 512th Bomb Sqdn. He was involved in a serious crash. He later joined the Reserves and retired as a Lt. Colonel in 1960. Allen Cadle was his instructor at Douglas. He had Basic at Canter Field and graduated from George Army Air Corps Field, Lawrence County, IL. He flew in W.W. II in the 486th Bomb Group 834th Bomb Sqdn and was recalled for the Korean War. Afterward he became a C.A.A./F.A.A. Inspector, checking navigational aids and flight standards. Had basic at Gunter Air Force Base, Montgomery, AL. Graduated Blytheville Army Airfield, Arkansas (S/N: O-810252).Then flew bomber and navigator trainees at Selman Field Navigator School (in AT-7s). He was a First Lieutenant in the USAAF reserves in 1947. Allen Cadle was his Instructor at Douglas. He graduated from Marianna Field, FL as a F.O. T-61229. and was assigned to Dale Malbry Field at Tallahassee, FL. He flew 100 plus trips over the ‘Hump’ (650 Hours) with the Ferry Command, Air Transport Command–India/China Division. He was discharged in 1945. Afterwards he spent 43 years with Eastman Kodak Co. He was a bombardier with the 387th Bomb Group 556th Bomb Sqdn, per Bombardier – A History (Volume 1) by Philip A. St. John. Had basic at Gunter Air Force Base, Montgomery, AL. Graduated Blytheville Army Airfield, Arkansas, S/N: O-810253. He was sent to England with the 8th Air Force, 384th Bomb Group, 546th Bomb Sqdn on April 12, 1944 and flew 32 missions in B-17s. See http://384thbombgroup.com. After the war he went to the Univ. of Michigan and became a Mechanical Engineer. Of Palm Beach Gardens, FL. Enlisted from Mercer County, New Jersey on 26 May 1942. Spent 6 years in Army Air Corps during World War II. See his obituary in the Washington Post. Had basic at Gunter Air Force Base, Montgomery, AL. Graduated Blytheville Army Airfield, Arkansas. S/N: O-810260. He had basic at Gunter Field, AL. and graduated from Marianna Field, FL. S/N: O-810435. He went to England on April 2, 1944 and was with the 406th Bomb Group, 512th Fighter Sqdn . He was killed in a flying accident over New Romnay England on April 21, 1944 in a P-47D. He was interred at the U.S. Military Cemetery Brookwood, about 30 miles southwest of London. Died June 28, 2007, Age 85 (see obit). Had basic at Gunter Field, AL, graduated from Marianna Field, FL. S/N: O-810438. Was assigned to Warner Robins AFB., GA.
Had basic at Gunter Air Force Base, Montgomery, AL. Graduated Blytheville Army Airfield, Arkansas. Later flew B-24 bombers overseas in the 486th Bomb Group 834th Bomb Sqdn and returned to U.S. afterwards. Of Wapto, WA. and ID. Had basic at Gunter Air Force Base, Montgomery, AL. Graduated Blytheville Army Airfield, Arkansas. Later flew overseas and returned to U.S. afterwards. Probably born 30 March 1923 and died 27 January 2008, buried at Idaho State Veterans Cemetery (click here for locategrave.org). Cambridge, England. Purple Heart (http://www.abmc.gov). He was delayed to class 43H from 43G. Basic at Gunter Field. Graduated from Blytheville Army Air Field, Ark. S/N: O-810274. He was with the 301st Bomb Gp. 352nd Bomb Sqdn. On July 18, 1944 he was the pilot of a B-17G (S/N: 42-102943) with a crew of 10 on a mission to Memmingen Aerodrome, Germany. The plane was hit by enemy aircraft. He became a P.O.W. in Luft-Stalag #1 located near Barth, Germany (MACR #7310). Had basic at Gunter Air Force Base, Montgomery, AL. Graduated Blytheville Army Airfield, Arkansas. He was with the 487th Bomb Group 838th Bomb Sqdn flying B-24’s. See http://www.487thbg.org/. Click here for a photo of him and his crew. Presley and Roy McDonald were his instructors at Douglas. Had basic at Gunter Field, AL and graduated from Blytheville Army Airfield, Arkansas, S/N O-810277. He was a pilot in the 22nd Bomb Sqdn, 341st Bomb Group. On May 29, 1945 he was flying a B-25J with a crew of seven on a mission to destroy locomotives between Vinh and Quang Tri in French Indo-China. His plane had a forced landing in a rice paddy field about one mile west of the village of Lam Cau, French Indo-China. He was taken prisoner and taken to the Japanese Gendarmerie jail at Vinh. On June 1, he was transported to Hanoi, his last known movement; it is not known if he arrived at Hanoi. Three of the seven crew members are known dead: 1 KIA and 2 died as POWs while trying to escape. Four, including Wirth, are still unaccounted for (MACR 15434). He was a navigator/bombardier in the European, African, and Middle Eastern theater of war in B-26’s (Bombardier – A History (Volume 1) by St. John, Philip A.). He was was shot down in April of 1945, wounded and exchanged for prisoners, per B-26 veteran web sites.